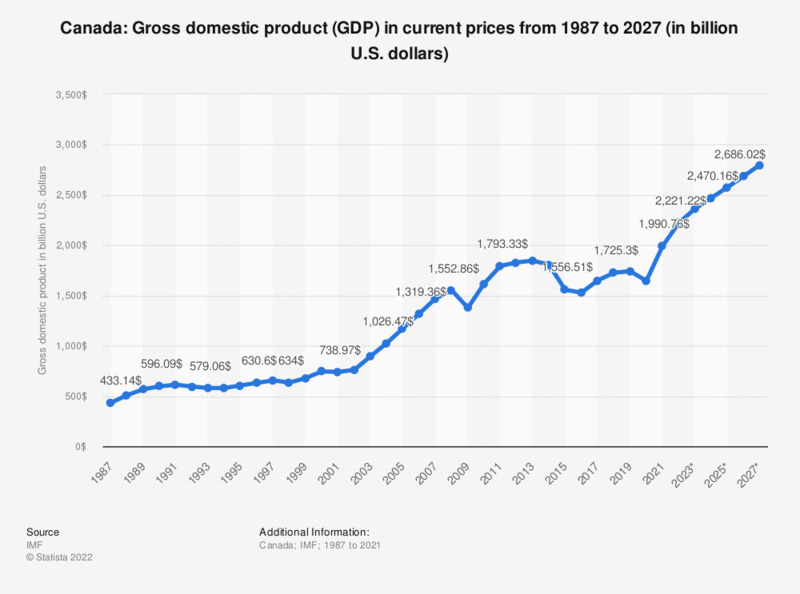 The statistic shows the gross domestic product (GDP) in Canada from 2014 to 2018, with projections up until 2024. In 2018, the gross domestic product in Canada was around 1.71 trillion U.S. dollars. Canada is the second biggest country in the world after Russia and the biggest country in North America. Despite its large size, Canada has a relatively small population of just around 35.9 million people. However, the total population in Canada is estimated to grow to around 37.5 million inhabitants in 2020. The standard of living in the country is pretty high, the life expectancy as of 2013 in Canada ranks as one of the highest in the world. In addition, the country ranks number eight on the Human Development Index (HDI) worldwide. All key factors point to a stable and sustainable economy. Not only is Canada’s population increasing, but the economy has been slowly recovering after the global financial crisis in 2008. The unemployment rate in Canada in 2010 was at approximately 8 percent (263696). Today, the unemployment rate in Canada is estimated to be around 6.8 percent, and it is estimated to decrease further. During the financial crisis in 2008, Canada's inflation rate amounted to around 2.4 percent. By 2013, the inflation rate was at less than 1 percent in comparison to the previous year. Canada is considered to be one of the world’s wealthiest countries. By value of private financial wealth, Canada ranked seventh along with Italy. In addition, its gross domestic product per capita in 2014 was among the largest in the world and during the same year, its gross domestic product increased by over 2.5 percent in comparison to the previous year. Canada’s economic growth has been a result of its political stability and economic reforms following the global financial crisis. In the period between 2009 and 2010, Canada was among the leading countries with the highest political stability in the world. Values have been rounded to provide a better understanding of the statistics.